Clean and Green is an environmentally-conscious emergency services company specializing in water, mold and fire remediation. What sets us apart is our dedication to using green products that are safer for people, pets and the environment. We pledge to work to relieve our customers of the stress caused by property damage, while always making the health of homeowners and their families our highest priority. 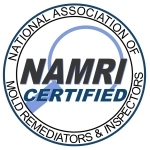 In order to continue providing our clients the best possible service, Clean and Green also provides MOLD TESTING in addition to our remediation services. All test results are verified by an independent lab. Proud Member of BNI Contractors you can trust!